Heart Space Studios has been host to a fascinating set of artists this week, Native Americans who are exhibiting their work at an exhibition called Messengers 2012 at Rainmaker, a Bristol gallery specialising in native art from south west America, mainly jewellry, but also prints, sculpture, paintings and textiles. Rain maker hired the studios for 2 events, a master class in bead-work “Making a Face” by Marcus Amerman, and also for a day of lectures given by several other artists in the exhibition, all of whom are renowned makers and scholars. 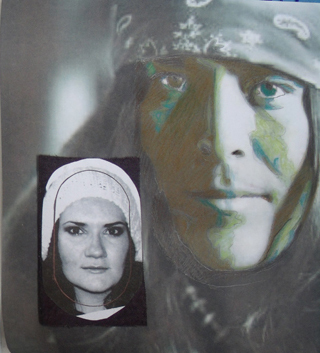 Marcus Amerman is an innovator in Photo-Realism in bead-work; he demonstrated how to develop a portrait in beads from a photograph, a technique that updates the bead-work tradition of Native Americans, where the beading is largely used for ceremonial costumes. 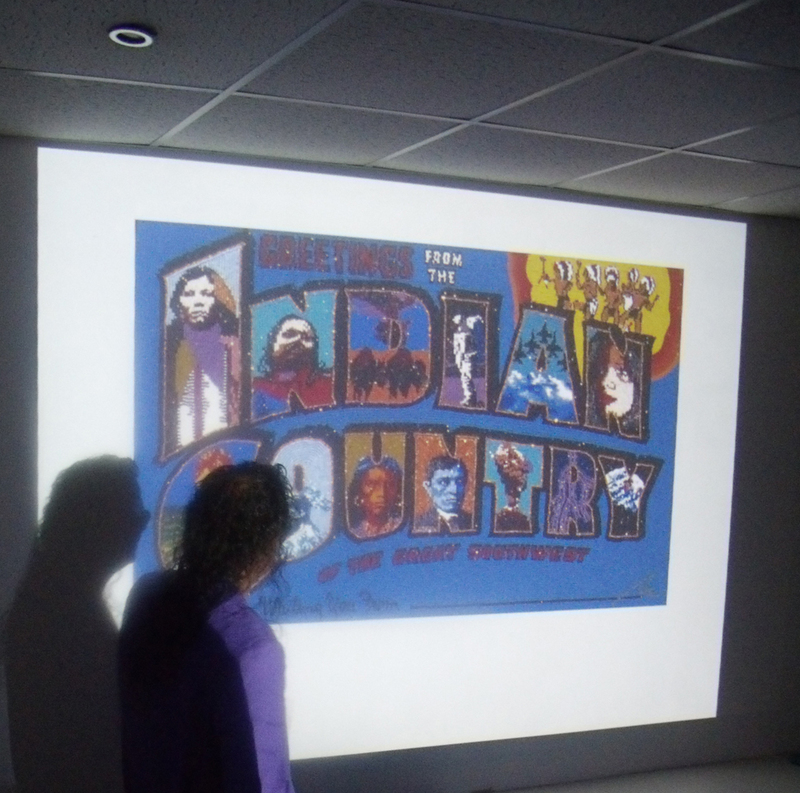 He showed how the portraits can be used for personal adornment as brooches, pendants or bracelets. 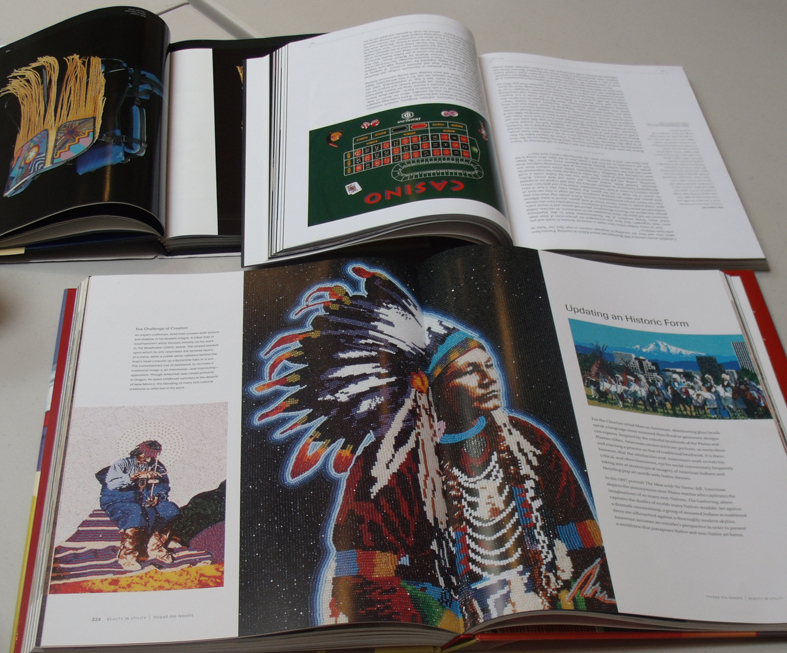 He started the class by showing a selection of his work and several books to illustrate various aspects of the craft traditions he has used in his career as an artist. 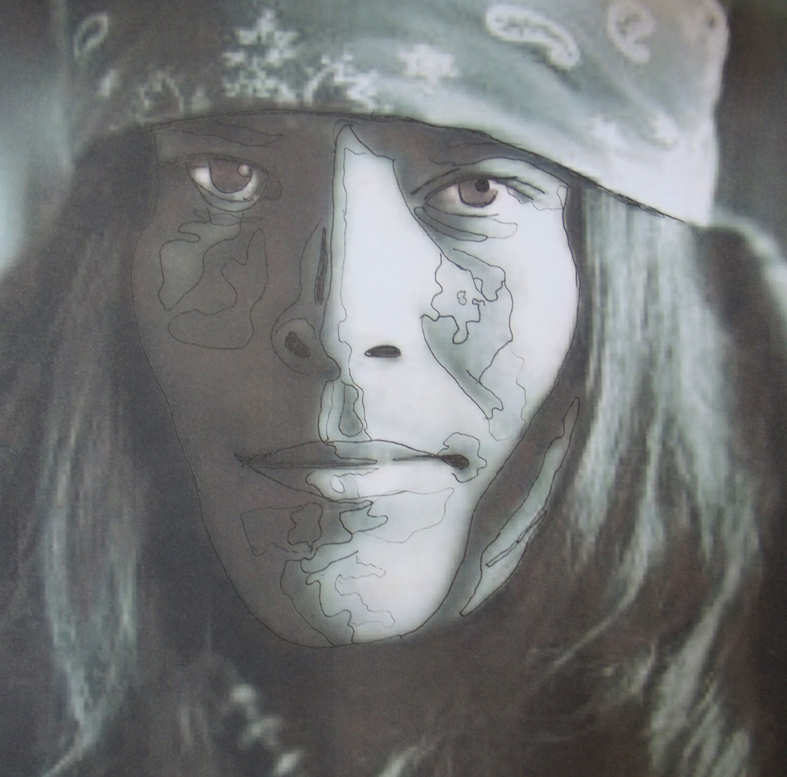 He was born in Phoenix Arizona to an Eastern European father and a Native American mother and is a member of the Choctaw nation. 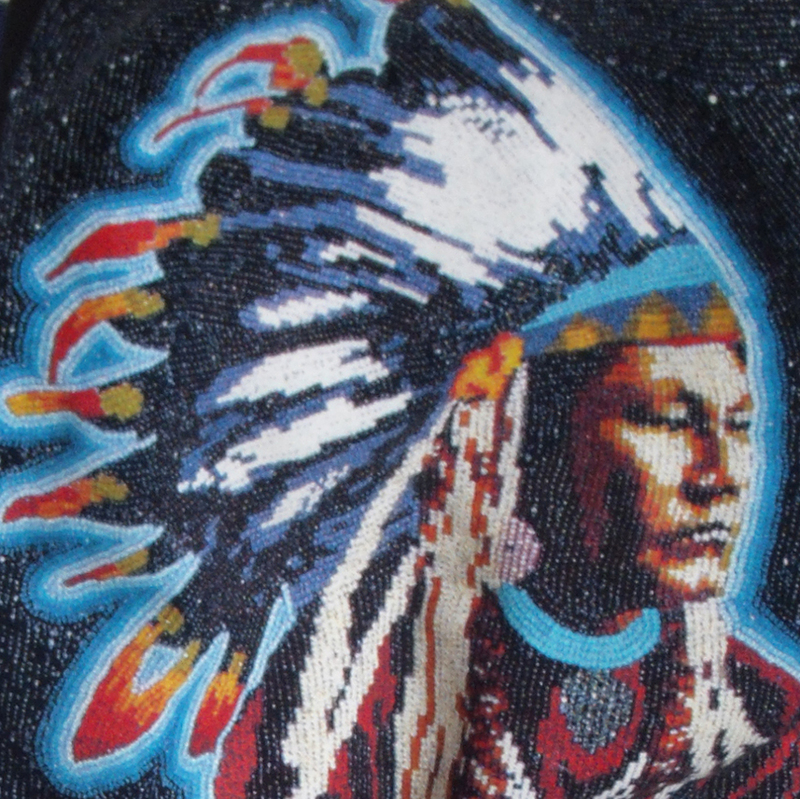 The bead-work tradition that he practices is, however, a specialism of the Hopi nation and his brother- in- law is a Hopi man – so this is where and he feels he has been influenced to adopt this beading method. He talked at length about duality within his work, and how beading, for him, embodies both masculine and feminine attributes; the beaded ceremonial pieces worn are by men to show strength and dominance, defying the world – but are made by women who “embrace the world” by their skills. 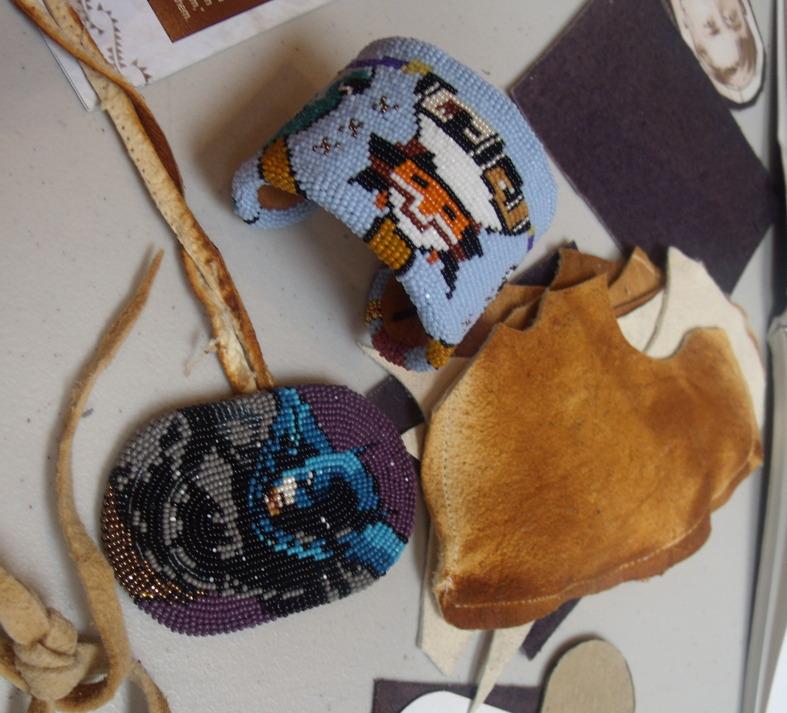 He also spoke of when he teaches this class to women who stitch traditional bead-work on reservations, how they invariably make very personal portraits of their own children so they can wear them everyday. 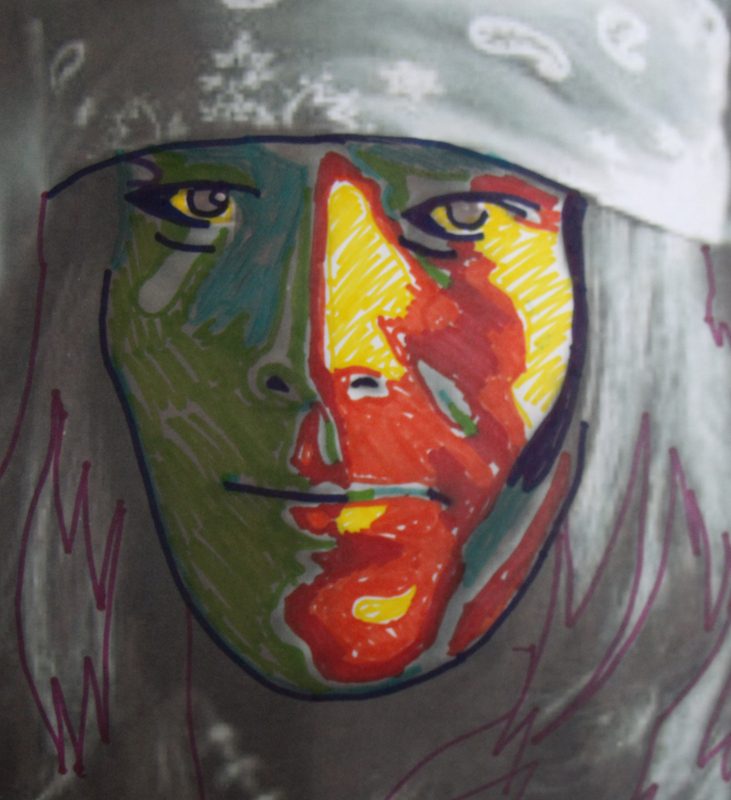 Like all the Artists that Rainmaker exhibits Marcus mixes different cultures within his work; he uses imagery from films, fashion, other crafts all bound together in a figurative manner that can make varied visions from popular culture to subtle political statements. 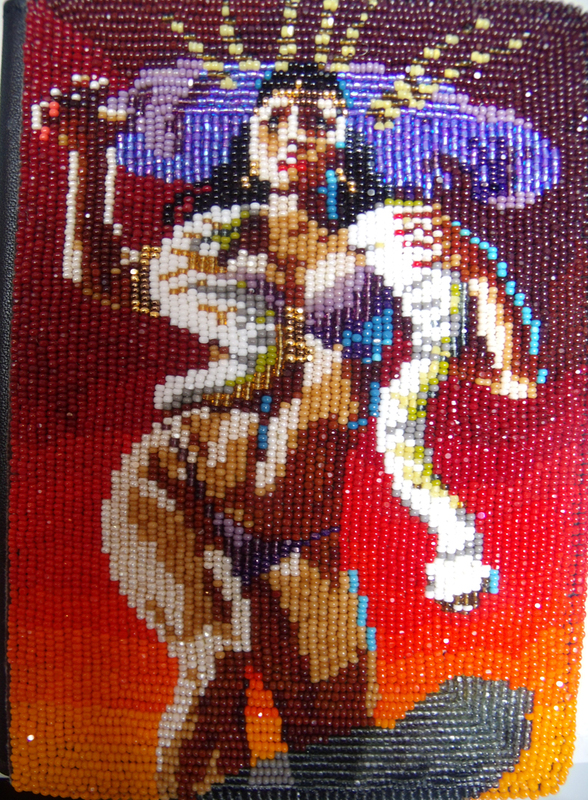 Salma Hayek in Dusk Till Dawn beaded onto a passport holder. He also makes clothes and costumes for his performance art and first started embroidering and beading his denim jackets when he was a young man – he still wears beads today, and practices several different crafts including enamel and kiln fired glass. I really admire the way that whatever Marcus makes, be it a passport holder, note clip or a subversive art work, he is at ease with himself and his chosen media and message. What I did find surprising about his work, having only seen it in books before, was its small scale – it looks monumental when illustrated, but it is full of detail, pattern and colour – you can hold it in your hands and it is a glinting, brilliant, faceted fabric…. truly remarkable. Now to the workshop – Marcus started everyone beading by first introducing them to the tiny beads he had brought with him and the smallest needles I have ever seen. They were stored in an animal hide needle case outlined in beads, the needle were sized from 11 – 13 and were very fine and very short for a beading needle. 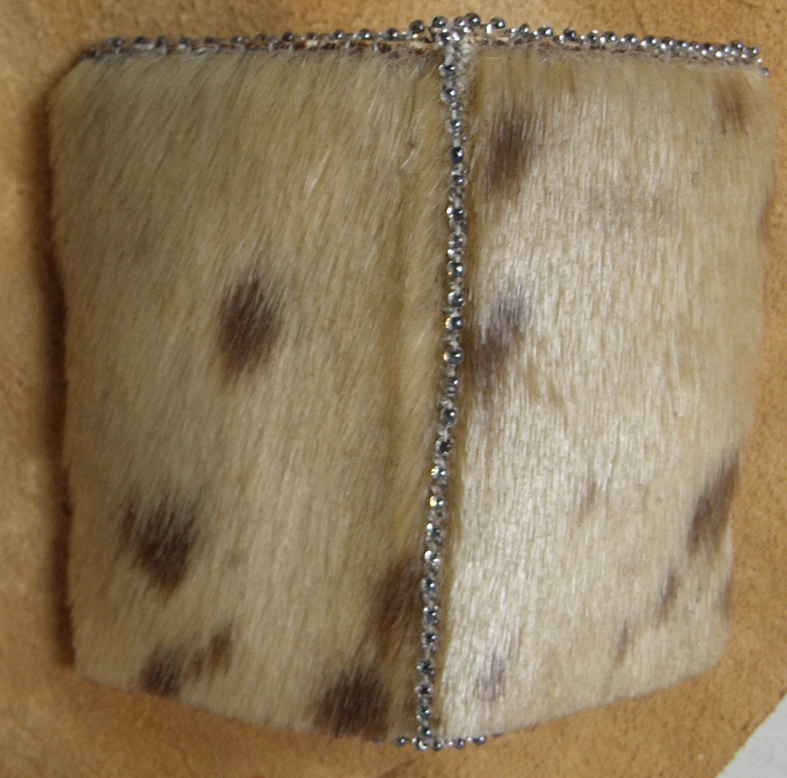 hide needle case adorned with beads. 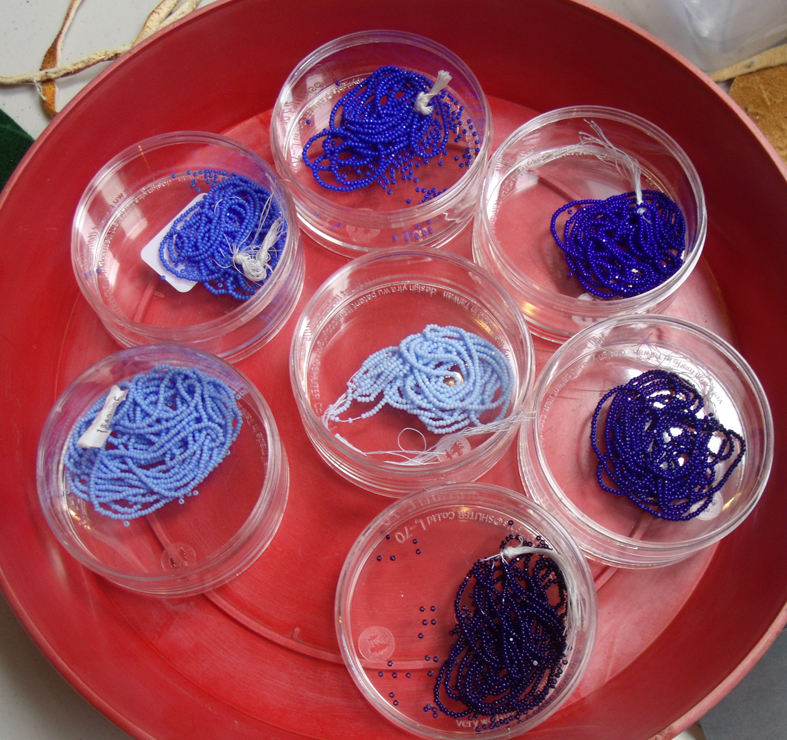 He brought 7 shades of blue beads to use for the faces and a length of each colour was given to everyone. Next they had to learn how to map out the facial contours for each shade, staring with the darkest tone. He gave everyone the same photograph to work with, stating with the darkest tone of blue they had to draw in all 7 tones. 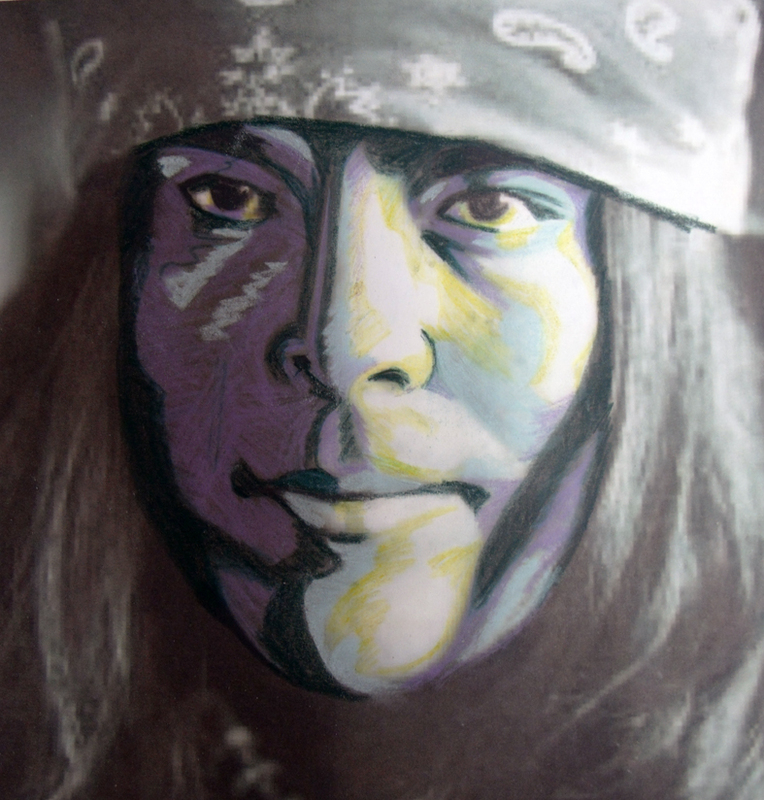 The image that was given to the students was a photographic portrait of another of Rainmaker’s artists, Shonto Beday, a Navaho painter and print-maker, who has work in the current exhibition as well. 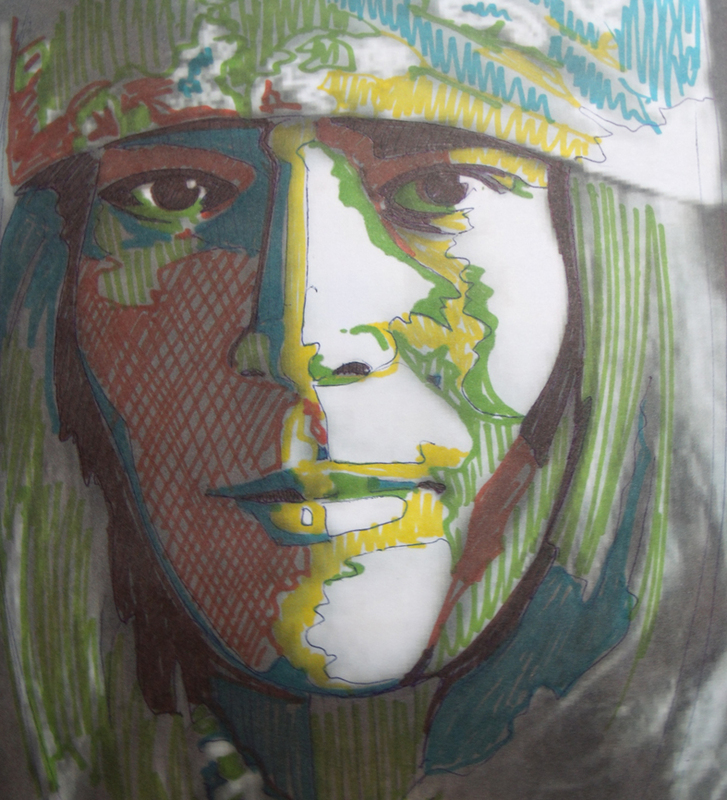 Each person had to draw around or shade in each isolated contour of the face – the results are so entirely different and you can see at once how everyone has their own way of seeing and perceiving. I really like these drawings, they make such an impact and clearly show that even when working from the same photograph everyone has a different perception and interpretation entirely of their own. 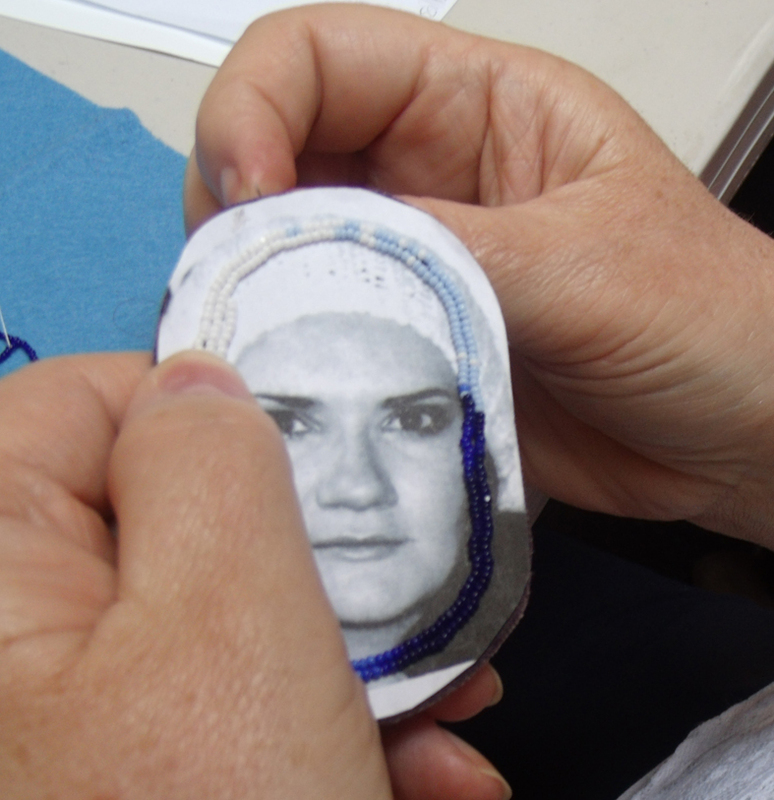 Now the students had to start stitching their own images, with only the contour map for a tonal guide – BUT not before they were shown the technique for stitching the beads straight onto the photographs in a spiral pattern. The photographs had been prepared for this by bonding them onto a specially reinforced paper backing made by brushing a thin card with several coats of a bonding solution. 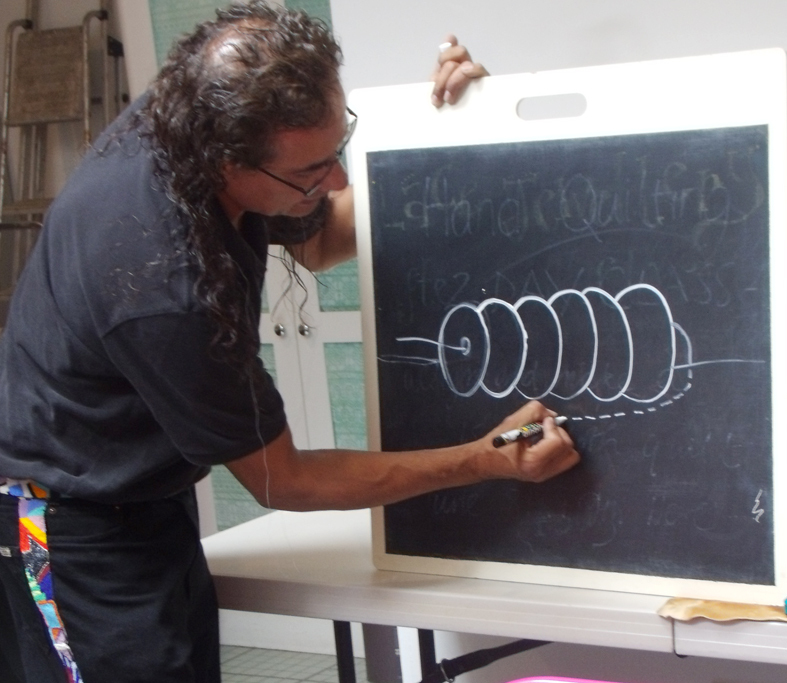 Marcus draws the stitch diagram for the spiral beading. The method of attaching the beads ensures an even and straight line of beads that can be manipulated around shallow and eventually tight bends – if you get the tension right. The maker than has to use their own judgement when to change the tones in the row of 6 beads – so that they cover the face exactly. Not so easy as it first appears. And now it becomes obvious why the beads have to be so tiny. 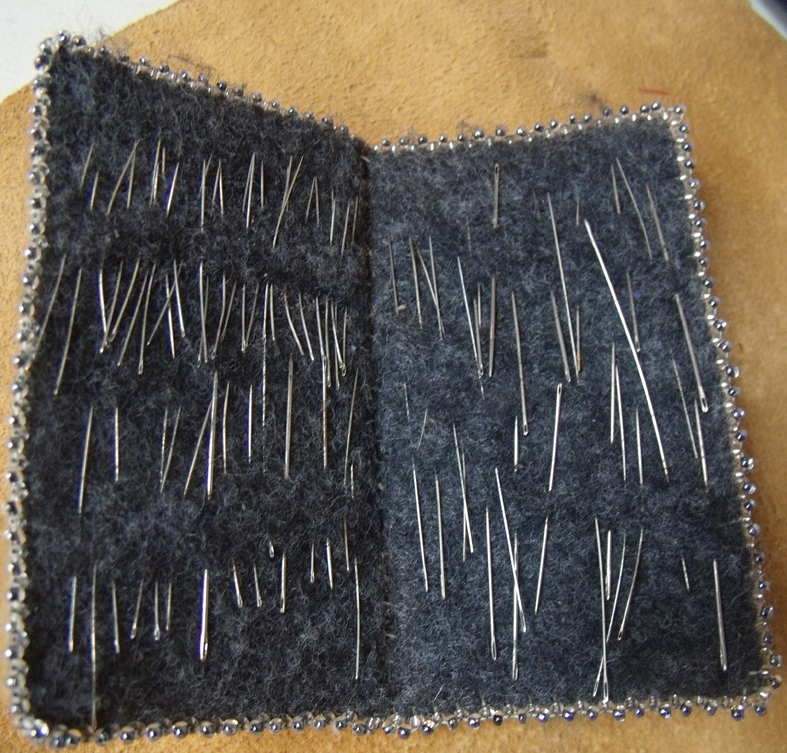 And just one bead needs to be stitched to show the bright reflective point in the eye – this gives the face life…and Marcus says that every beader he has ever taught uses a different colour or type of bead to represent this point.